An improved gravitational lensing technique provides a glimpse of Icarus, a star located about 9 billion light-years from Earth. G	G	ravitational lensing has become a remarkably handy tool, as astronomers are refining and enhancing the ways they can use what has been called “nature’s telescope” to find objects in the cosmos. Two separate studies published April 2 in the journal Nature Astronomy describe how gravitational lensing has provided remarkable views of different types of “extreme” stars that are normally too far away and dim to be detected. Because of unique lensing events, the stars — nicknamed Icarus and Spock — have been observed multiple times with the Hubble Space Telescope. 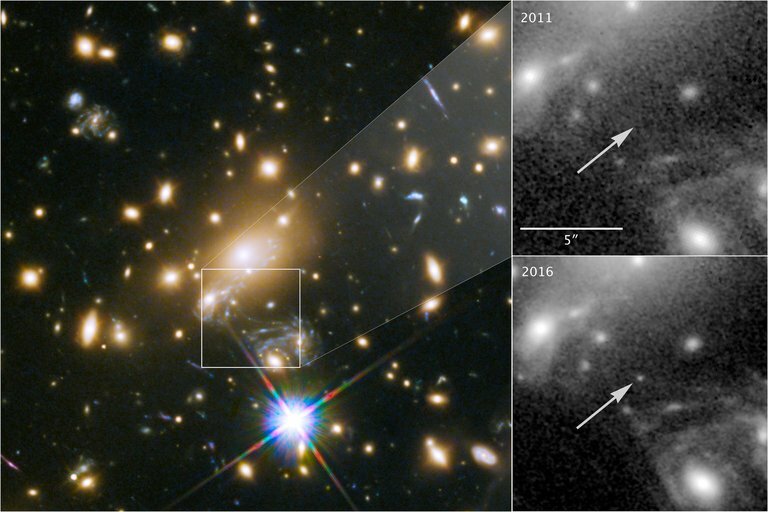 In one study, astronomers used gravitational lensing to see Icarus, or MACS J1149 Lensed Star 1, the most distant star ever observed, located about 9 billion light-years from Earth. Usually, lensing magnifies galaxies by up to 50 times, but in this case, the star was magnified more than 2,000 times. This is the first time a “normal” star — one that was not exploding as a supernova — has been observed at such a great distance. “You can see individual galaxies out there, but this star is at least 100 times farther away than the next individual star we can study, except for supernova explosions,” Patrick Kelly, from the University of Minnesota, said in a statement. Kelly led the Icarus study. Researchers reported that the two Spock stars, named HFF14Spo-NW and HFF14Spo-SE, were seen “twinkling,” which, the team writes, is thought to be caused by "separate eruptions of a luminous blue variable star or a recurrent nova, or as an unrelated pair of stellar microlensing events." For both studies, however, the brightness seen through the lensing events had one thing in common: The gravitational lensing was caused by not just one galaxy, but a cluster of galaxies, which can greatly enhance the effect. Normally, gravitational lensing occurs when two galaxies happen to align with one another along our line of sight in the sky. The gravitational field of the nearer galaxy acts as a lens, magnifying the light coming from the stars behind them. In the past, astronomers have used this technique to measure the shape of stars, search for exoplanets, and measure dark matter in distant galaxies. In the case of the two current studies, clusters of galaxies acted as the lens, providing extreme magnification from the gravitational field generated by multiple galaxies. Kelly added that the launch of the James Webb Space Telescope should be “terrific” for doing just that, and astronomers are hoping to find many more lensed stars using the telescope. In a commentary about the studies, astronomer Roseanne Di Stefano from the Harvard-Smithsonian Center for Astrophysics said these types of observations highlight a new frontier for sky watchers. This type of lensing, both teams said, is providing new views of events and processes we would otherwise be unable to observe, since faint stars and non-supernova stellar outbursts are not generally detectable at such great distances. The brightening is intermittent, however, because of the movement of the galaxies. So astronomers need to determine whether the intermittent brightening is a factor of a transient star, the movement of the galaxy clusters, or other types of events. The observed light from Icarus was emitted about 4.4 billion years after the Big Bang, when the universe was only about 30 percent of its current age. The prevalence of galaxy clusters means this effect could be used more frequently to look deeper into the past, and study the evolution of the earliest stars.